Ernesto Valverde’s team go nine points clear of Atlético in the La Liga standings with a hard-fought comeback win against Real Sociedad at the blaugranas’ bogey ground of Anoeta. The 4-2 victory was the perfect start to a run of three away games for Valverde’s men as the team dug deep to turn the game around from two goals down. Barça lined up with Messi and Suárez up front and Paulinho and Gomes on the left and right hand-side respectively of a 4-4-2 formation. In the second minute, the Uruguayan burst into life as he nutmegged a defender and charged at the goal but the home keeper Rulli dove at his feet to claim the ball. Real Sociedad took an early lead as the experienced Xabi Prieto swung in a delightful cross from the right and Willian José headed the ball in off the underside of the crossbar, leaving Ter Stegen with little chance of making a save. Valverde’s side knew the game was going to be tough and the home team’s 11th minute opener made the job harder still and put their unbeaten start of the 2017/18 season at risk. They responded by breaking at pace from a corner and Messi drove towards the penalty area before feeding Rakitic, who passed to Paulinho. The Brazilian’s effort was blocked before the referee stopped play for a previous foul from the blaugranas. Real Sociedad were full of confidence and the blaugranas were struggling to fashion any clear chances to draw level despite Messi’s best efforts. Canales had a shot Ter Stegen saved with ease following a passing move from the back. Then Real Sociedad put the ball in the back of the net through Willian Jose but Zuruzureta was judged to have fouled Rakitic when dispossessing him. The match opened up even more as Jordi Alba charged down the other end and almost got on the end of the ball. The prominent Canales then cracked a shot towards Ter Stegen’s near post but the German keeper saved smartly. Following this, Real Sociedad attacked again and Canales produced a lovely chip behind the Barça defence allowing Juanmi to shoot and his effort deflected off Sergi Roberto and in to give the home side a 2-0 lead in the 34th minute. FC Barcelona were in trouble and needed something to spark them into life and the Brazilian summer signing provided just that before the end of the half. The blaugranas passed the ball around accurately before Luis Suárez burst through and fed Paulinho, who had a simple tap-in from close range to make it 2-1 in the 39th minute. The second half began with Canales once again having an influence on the game as he skipped past Vermaelen and had a shot. Then Messi went past the opposition keeper but ended up being dispossessed by Rulli as he dove at his feet. Messi found space and ran at Real Sociedad before feeding his Uruguayan strike partner to his left. Barça’s number ‘9’ had a look before curling an absolutely delightful finish into the opposite corner to bring his side level within five minutes of the restart (2-2). The game became less end to end following the equaliser as Zurutuza went off injured. Oyarzabal came on for goalscorer Juanmi and then Dembélé replaced another goalscorer in Paulinho. In between all the changes Messi slalomed through three defenders but was eventually dispossessed. Dembélé’s first meaningful action of the game came as he was set free by Sergi Roberto and he chased down the ball before crossing towards Messi but the keeper claimed the ball with ease. Ernesto Valverde’s team managed to make it 3-2 in the 71st minute as Real Sociedad lost the ball following a goal-kick. The ball fell to Suárez, who had Messi in support but didn’t need him, as he finished past Rulli with ease for his second of the night and eighth in the last six games. To cap off FC Barcelona’s fabulous reaction to going two goals down, Lionel Messi curled a sumptuous free-kick over the wall from 30 yards out leaving Rulli rooted to his spot. 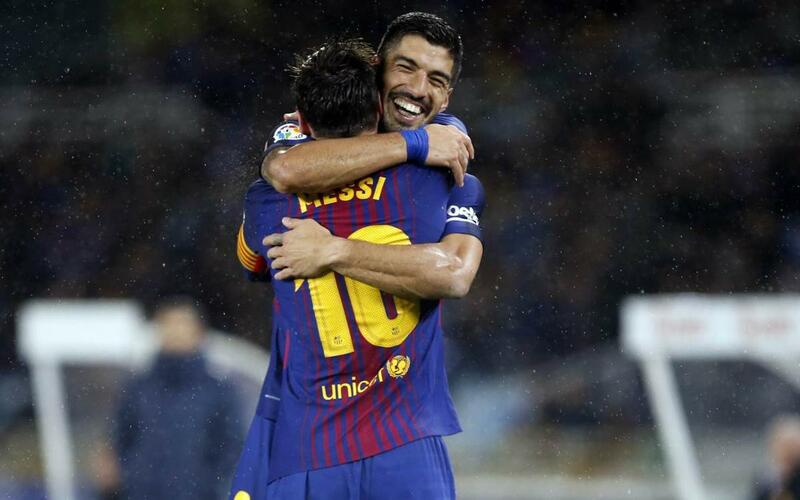 This meant the South American strike duo secured Barça’s first La Liga victory at Anoeta for 11 years.